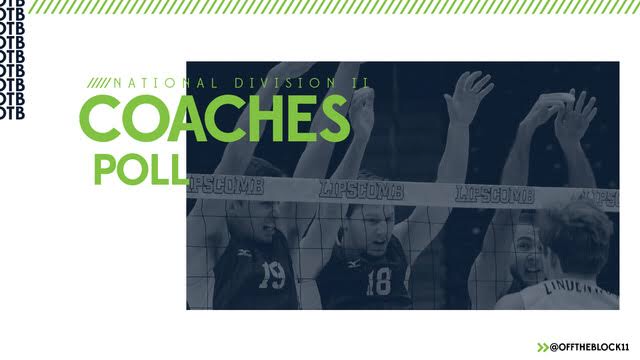 The order remains the same in the latest Off the Block/Springbak Division II National Coaches Poll that was released Tuesday morning, but Lewis received all eight first-place votes and Concordia-Irvine received all eight second-place votes. The Flyers were a unanimous No. 1 for the first time weeks in the poll. Lewis swept Fort Wayne and Ball State this weekend. The Flyers were led by 25 kills from outside attacker Ryan Coenen and 11 blocks from reigning National Freshman of the Week middle attacker TJ Murray. Lewis this week travels to No. 3 McKendree and Ohio State, both of whom the Flyers defeated at home earlier this season. Concordia-Irvine stayed at No. 2 after losing to Grand Canyon on Friday in four games but defeating a pair of NAIA opponents on Saturday. McKendree remains No. 3 in the coaches poll after sweeping Quincy and spliting a pair of matches with Princeton. The Bearcats were led during the three matches by 43 kills from Jared Wilcox and 41 kills from Nolan Reuter. Middle attacker Brendan Schmidt was honored as Off the Block/Molten‘s Middle Attacker of the Week for his 24 kills in the two matches versus Princeton. McKendree this week plays host to No.1 Lewis and Loyola. UC San Diego returns to the court this week as it travels for a pair of matches versus Hawai’i. Barton has yet to advance in the poll despite having a 12-match win streak and a perfect 13-0 conference record. Barton last week defeating Coker in four games and sweeping both ConfCarolinas matches versus North Greenville and Limestone. The Bulldogs success has not been without notice, as outside attacker Aleksa Brkovic was honored as Off the Block/Molten‘s National Outside Attacker of the Week. Also, Barton is only two spots behind EIVA-leader George Mason in the latest RPI rankings released on Monday. The Bulldogs are off this week before playing three matches next week to conclude theirregular season.